Now you can stop worrying and procrastinating about OSHA safety meetings. 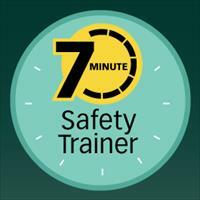 Here's the resource that's done all the hard preparation for you: the 7-Minute Safety Trainer. It delivers complete 7-minute meetings - from outlines to speaker notes to reproducible handouts! Select from more than 50 key occupational health and safety meeting topics, and then copy the reproducible handouts. You're ready to go with a brief and effective safety meeting that you can deliver in as little as 7 minutes. Each meeting outline helps you comply with a specific OSHA regulations, such as hazard communication, electrical safety, lockout/tagout, forklifts, etc. The sessions are effective and fast to get workers trained and back on the job.